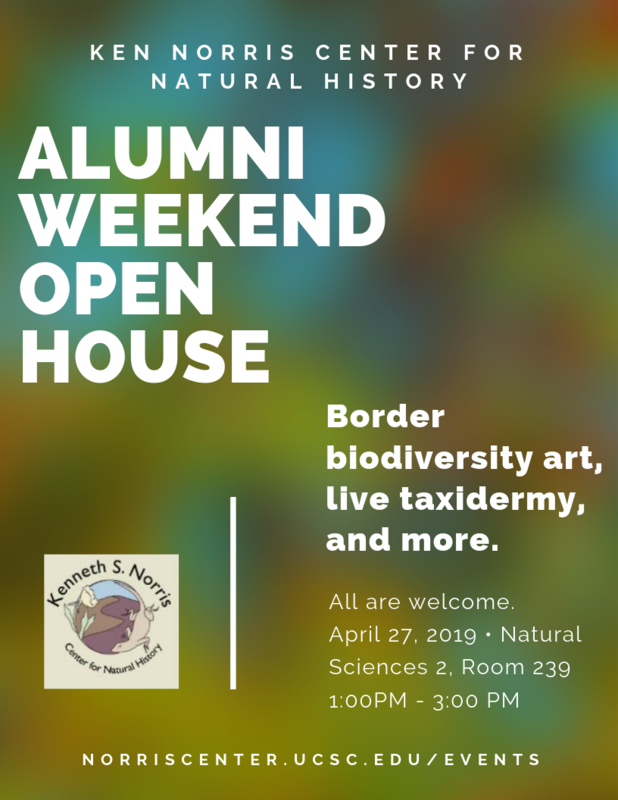 April 27, 2019: The Norris Center is hosting its annual Open House for Alumni Weekend! All are welcome to attend! The Norris Center will showcase the Randall Morgan Insect Collection, an art exhibit of animals that would be affected by the proposed US-Mexico border wall, a live taxidermy demonstration, and more! Refreshments provided. The center will showcase its collections, art, and, best of all, the taxidermy procedures that make it all possible. There will be a live taxidermy display demonstrating how they turn donated specimens into scientific museum study skins. Refreshments provided. 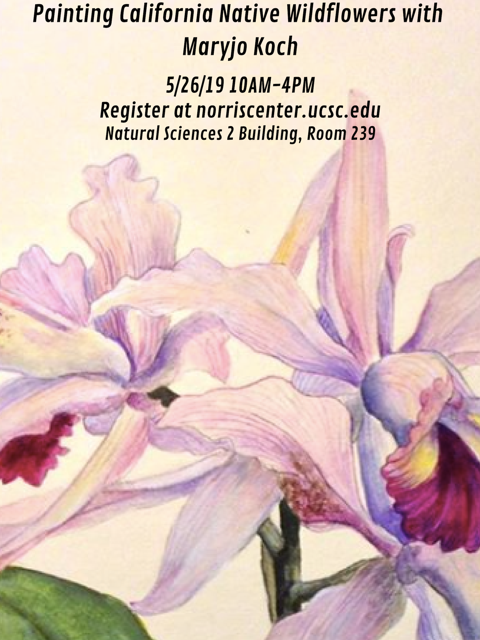 May 26, 2019: Painting California Native Wildflowers with Maryjo Koch at the Norris Center. Join renowned artist Maryjo Koch as you learn to paint the beautiful wildflowers of California. No experience is required, and all materials are provided. The event is open to all. Students can register for $20, and community members for $60. SCMNH has lots of great lectures, events, and workshops. Visit their website for more information on their upcoming endangered species lectures and seed gathering workshops. The Seymour Center has frequent lectures on marine biology, leads many outreach events for the public, and offers public tours of the nearby Younger Lagoon. Check out their events calendar here. The Pacific Grove Museum of Natural History has great exhibits on everything natural history related about Monterey County. Each year they also feature the natural history illustrations of CSUMB's students. Those students visit the Norris Center during their class, and do really great work. 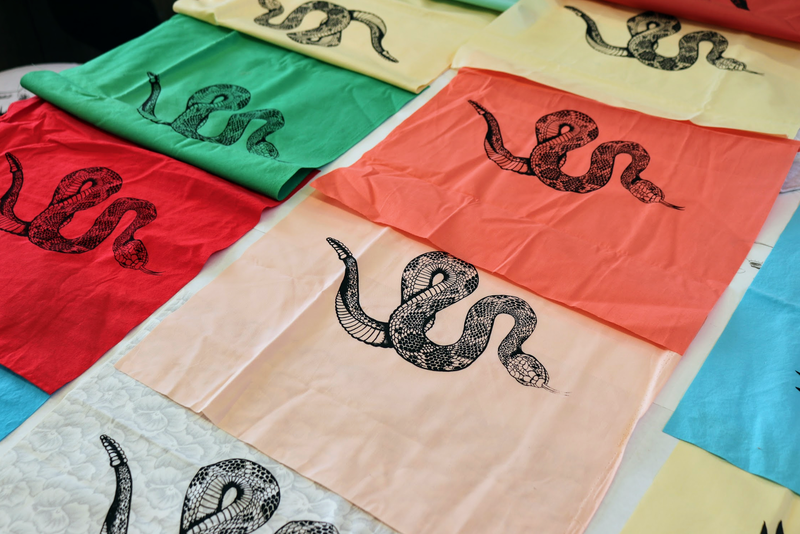 Check out the museum's current offerings, and especially visit for the CSUMB student artwork.